Microsoft recently announced the launch of the latest addition to their Partner Network: Websitespark. Following on from the success of the Bizspark programme for startup companies, Websitespark is aimed at supporting professional web development and design companies to succeed by offering proactive assistance in the form of business opportunities and it’s class-leading Windows and SQL Server products. So, whether you’re the “one man band” or a team of up to ten employees, you should check this out. BizSpark has already helped hundreds (thousands, now, perhaps?) of startups to succeed, and Websitespark looks set to do the same for smaller teams of web professionals. With no up-front costs and no long-term commitments (just a $100 exit fee at the end of the programme period) , what more could you ask for? “European buyers of Windows 7 will have to download and install a web browser for themselves,” according to this BBC News article, published today. “Bowing to European competition rules, Microsoft Windows 7 will ship without Internet Explorer”. This, it would seem, is another victory for the European Commission and it’s competition rules. Microsoft has previously fallen foul of these in early 2008 when it was fined £765m by the European Commission for ‘anti-competitive behavior’: including Windows Media Player and Internet Explorer with Windows. Understandably then, it has decided to avoid that kind of financial pain again by bowing to the pressure. Why does it matter what Microsoft choose to ship with Windows? It’s not like I have to pay for Internet Explorer, or any other browser by any other vendor, for that matter. So I, the consumer, am not losing out by it’s inclusion in the operating system. 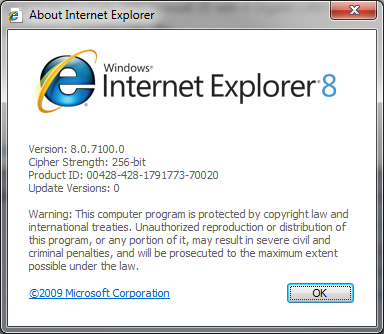 Internet Explorer, like Windows Media Player, are features designed to make the operating system better, easier to use and increase the overall value of the product. Browsers should be features of every operating system. Every major consumer-targeted operating system has it’s own browser included. Let’s take Apple’s Mac OS, for example: that ships with the Safari browser. Safari and IE browsers do essentially the same thing, and they are distributed to the consumer in exactly the same fashion: automatic inclusion by the vendor on to the newly purchased computer. Yet, Apple aren’t the target (so far as I know) of the EC competition rulings because they aren’t the market leader. To impose this type of ruling on Microsoft because they are the market leader seems very similar to saying that Microsoft are the market leader because of Internet Explorer, which isn’t true at all. So surely, if you’re going to impose this type of rule on any vendor then surely you must apply it to all of them: that’s really the only way to give consumers a free, fair choice, right? I assume that the EC are interested so much in Microsoft’s activities because it holds the majority market share. So too, then, I would assume it to be equally interested in Nokia, who according to this article, held 40.43% of the Mobile Device market share in Q12009, making them the market leader. Are Nokia the subject of an EC competition rules enquiry for bundling their own software with their device? I can’t see much practical difference either, between companies like Dell and HP, who pre-bundle their own proprietary software programs and utilities onto the PC’s they ship, and this, either. Perhaps the EC will go after these companies under their ‘anti-competition’ rules, too. Eight or 9 times in 10, most users don’t care what browser they’re using: at least in my experience. Most consumers just want something that works. They don’t care what it is, why should they? I certainly don’t get all shirty when my new car comes with Michelin tyres, or Goodyear, or – who cares… they do the job. But my point is, if I do want something different, I’m free to change those tyres. Perhaps I’ll read that Pirelli tyres are better than my Goodyears, and I’ll change them. Just as I can change my browser, any time I want to. And I don’t need the EC to make that happen for me because Microsoft haven’t prevented me from using Firefox, or any other browser, for that matter. And that’s the point: this is about education. Those who know enough to understand why they might want another browser, and can make a comparative choice, are completely free to do so, and (if I do say so myself) it is ridiculously easy to swap to an alternative. I can’t say the same about the tyres on my car though (the ones I’ll have to pay a hefty cost to change). Thankfully, swapping my browser is free and easy. And that’s another reason why these confusing rules make me, well, confused. Now, when Windows 7 ships in Europe, what on earth will the majority of consumers do? What will Microsoft do, in order to help users make the choice that’s right for them? Will consumers see a choice of browsers pop up on their screen? How will they choose? Why should they have to choose? Does Mr And Mrs Average really care? Please comment!